Being described as 'a jewel of the Amalfi Coast' raises expectations somewhat. But this civilised old resort town has carried this accolade for years and is used to it. She perches comfortably on the side of a broad stretch of pine-clad cliff next to the Amalfi Drive. Leaving the honour of keeping lookout across the Bay of Naples to a set of famously luxurious hotels - obviously some of the best places to stay in Sorrento! 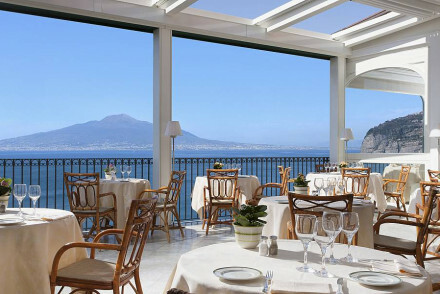 - from which guests can view Mount Vesuvius, Capri and Naples as they dine on the terraces. Sorrento's Duomo is impressive, it has a fresco on the outside, a triple tiered bell tower, elegant but unusual columns and a clock. The Chiesa di San Francesco has lovely Arabic influenced architecture and famously lovely cloisters which host a world class program of concerts in the summer. The Correale Museum has a rich assortment of arts and crafts, with an especially notable clock collection, embroidery display and Greek and Roman artefacts. Sorrento makes a good base for exploring the peninsula, Pompeii and the other nearby archaeological sites, and Capri. 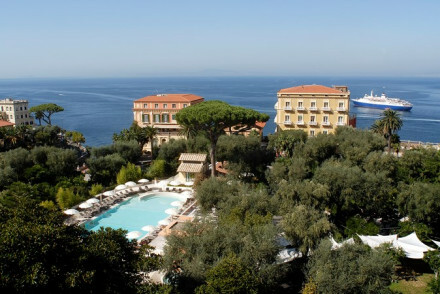 Beautiful and historic, Sorrento is also a resort town. So there are plenty of local souvenir shops selling the lacework, ceramics and marquetry that people have been bringing back for centuries. There are also mellow, sunlit piazzas to ponder in, bustling markets to nose about in, chic little boutiques to overspend in and a seemingly endless choice of heavenly local eateries. 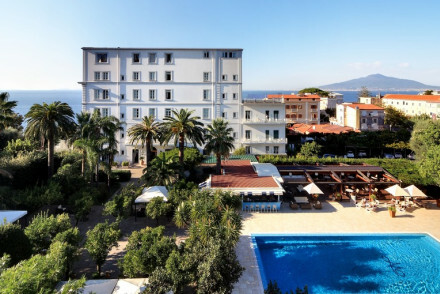 As you'd imagine the city is hugely popular especially during the peak summer months, so if you want to bag yourself a bed in one of the best places to tay in Sorrento, do yourself a favour and book early! Otherwise, plan your visit for quieter months, when the streets will be less crowded, but the location no less beautiful. 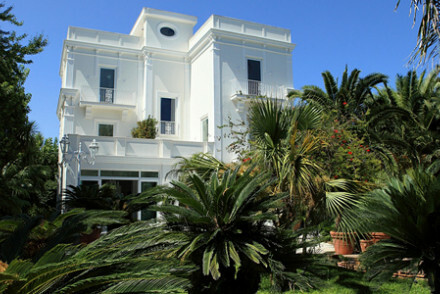 The Villa Eliana is outside Sorrento, but its views of pretty Sorrento and the gulf beyond mean it deserves inclusion. 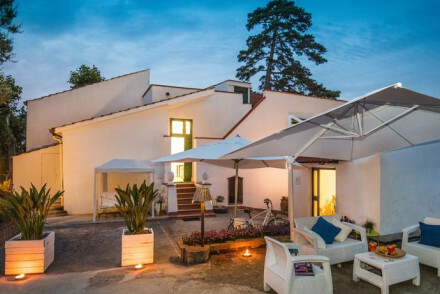 Originally built in the 60s as a private villa for the wife of a Neapolitan ship-builder, the house has fab. retro architecture, modern decor and just six rooms. If you like the sound of those 'famously luxurious hotels' then book the Bellevue Syrene. Once a private residence, this palace has been romantically refurbished so is now a palace for many. There are rambling terraces with breathtaking views, marble floors, vaulted ceilings, private pools and a private beach… Ideal if you're planning a romantic break. The Villa dei D’Armiento is just along the coast from Sorrento, a large white, converted mansion once home to a nobleman. Decorated with flair, these seven rooms are definitely boutique and very chic. There’s a garden with a lovely pool and you’re just a short stroll from the beach. 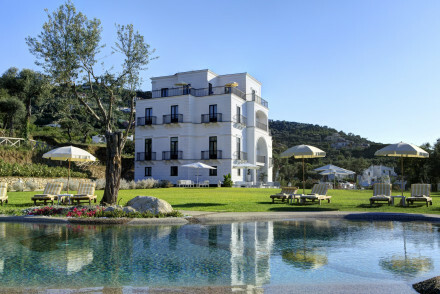 The Grand Hotel Cocumella is a chic and charming mid-sized hotel on the outskirts of town. There are spectacular ocean views and the hotel is surrounded by quiet gardens, plus a choice of three restaurants. 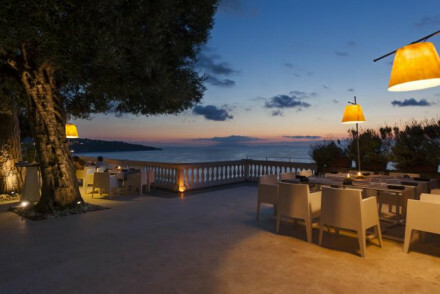 For those who prefer something chic and boutique, one of the best hotels in Sorrento is Masion la Minervetta. With only 12 rooms decorated with a nautical theme, this place is fun, funky, has wonderful views and feels like a home from home. Only 15 minutes walk from the centre of town, it is also perfect if you want to be in the heart of things. The Palazzo Marziale is a traditional townhouse with 10 colourfully decorated rooms with a retro but elegantly Italian vibe. Close to local cafes and restaurants, or they have a great cafe in house. 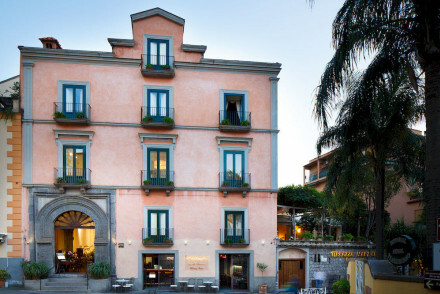 Maison Tofani has been carefully converted from a splendid 18th century townhouse in the heart of Sorrento and is now a 12 rooms design hotel with a great seafood restaurant. 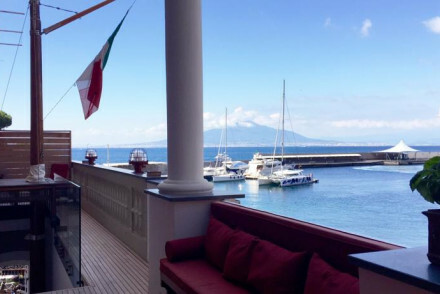 Perfect for anyone who can afford it, the beautiful Belle Epoque era Grand Hotel Excelsior Vittoria has a fabulous spot overlooking the gulf of Naples with a selection of 91 rooms and suites - some of a very generous size - plenty of history and a romantic restaurant. 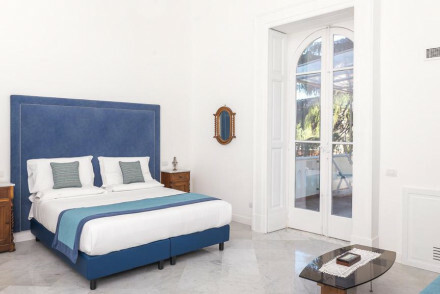 The Palazzo Montefusco is a boutique guesthouse in the historic part of Sorrento with five contemporary rooms and a private stretch of beach just for hotel guests! 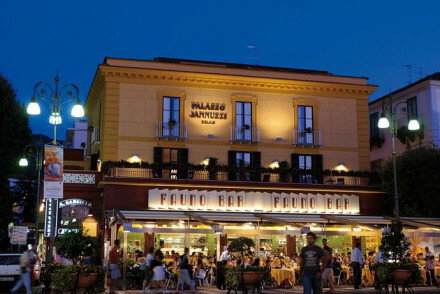 The Palazzo Jannuzzi Relais is just a short stroll from the beach on the postcard-perfect Piazza Tasso. There are 12 rooms, decorated in cheery yellow - some with private balconies. Veru B&B is a welcoming three room B&B in the centre of town close to the Cross Italia. 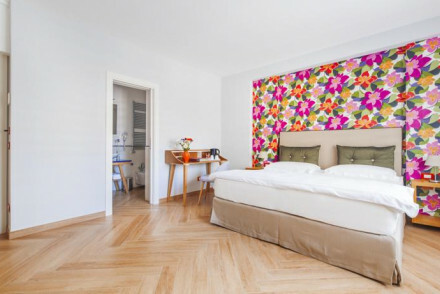 You have everything you need for a great night’s sleep in these stylish, modern European rooms. If you’d prefer to stay in an apartment or private villa we recommend you visit our online partner Booking.com. Naples Airport is Sorrento’s closest, from which there is a good, regular bus service. Alternatively you can catch a taxi down to the hydrofoil port and sail across the bay, or take a taxi all the way. You can also arrive via rail or by water missing Naples out completely if you’re not coming from that direction. If you want to hire a car - which we strongly advise if you’re staying in Sorrento and you want to see more of the Amalfi Coast - we recommend you visit our online partner Rentalcars. Even in wet winter Sorrento still gets eight hours of sunshine a day! That’s what a Mediterranean climate will do for you. Summer is hot and dry and spring and autumn are very pleasant. Summer is peak time for visitors. If you want to swim in the sea try September or October; if you’re just looking for sunshine then May will be beautiful. Or consider all our recommendations in Campania? Or contact one of our friendly Gurus for advice. A fabulous hideout overlooking the Port of Sorrento. Rooms are decorated with antiquities recovered from local shipping fleets, creating an atmosphere of charmingly decorated sea cabins. Romantic views of the coast, a perfect location for those wishing to explore the beautiful sights of Naples. 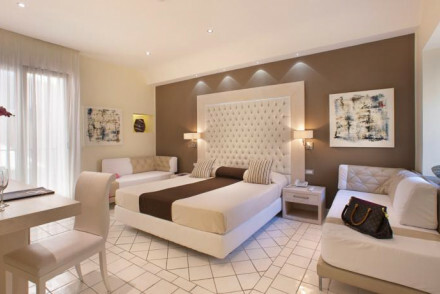 A welcoming B&B, ideally situated at the centre of Sorrento. Stylish modern European rooms - bright white with splashes of colour and spotless private bathrooms. There are just three rooms at the hotel, making it a haven for a good night's sleep whilst exploring the beautiful city and coast. Just a short walk from the beach and located on the postcard perfect Piazza Tasso. Bedrooms are decorated in a bright and cheery yellow and some have small private balconies. A friendly little bed and breakfast great for local exploring. Local exploring - A great base for exploring Sorrento and the wider Amalfi Coast region. A traditional town house property; the interior displays a candy box coloured design treat. Each of the ten rooms are decorated in a grown-up retro style combined with Italian elegance and antique pieces. Breakfast, cakes & pastries are served daily. Sorrento's popular cafes are walking distance. Sights nearby - Trips to the archaeological city of Pompeii can be arranged. Sailing - Take a boat the beautiful island of Capri for the day. Designer - Uniquely designed interiors. 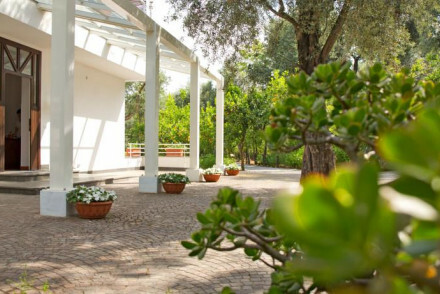 Elegant renovated farmhouse, surrounded by a beautiful garden with olive, orange and lemon trees. Chic modern rooms are bright and airy, embellished with ornate tiles and fabrics. Guests can enjoy a moment of calm on the sun terrace and breakfast is served under a lush traditional arbour. Stately cliffside hotel with a pool as well as private beach access, and two great restaurants to choose from. Expect shining marble floors, high ceilings and period furniture, while elegant bedrooms have a muted palette of coral, fuschia or blue. An intimate spa and awesome views seal the deal! Sailing - Can be booked nearby. A stuccoed 19th-century villa with a pretty leafy garden and pool. Interiors are elegant featuring fine tiling, craft Italian furniture and artisan ceramics. Rooms are fresh and airy with arched windows and garden views, in a soft palette of blues and whites. Quality old-world sophistication. Romantic - Good for couples. Under refurbishment during 2019. Very chic, very boutique. A large white mansion, previously a nobleman's house, decorated with flair. Huge white washed rooms with high ceilings filled with art and antiques. Lovely garden and swimming pool, and a short walk from the beach. Sleeps up to eighteen. Local markets - Good for local colour. Sights nearby - Well located for major sights. 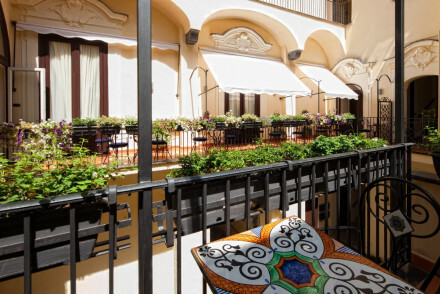 A boutique guest house in the historic town of Sorrento. Bedrooms are contemporary, spacious and bright. A private area at the beach is reserved for hotel guests. Clean and contemporary. An ideal property for exploring the wider area and enjoying the best of the town. Sights nearby - In the heart of Sorrento's old town, just minutes from the most interesting historical and cultural sites. 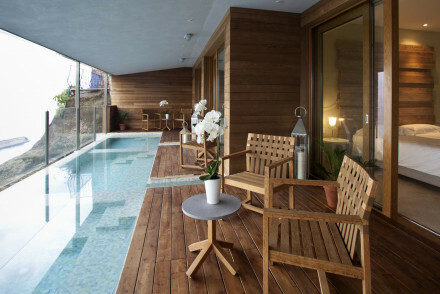 A wellness hotel on the Amalfi coast with sea views and an elegant spa. The six tranquil bedrooms, designed with relaxation in mind, each have a private plunge pool on the shared outdoor terrace. Relaxed, communal dining and restaurants nearby. A fantastic location to explore the local region. Total relaxation - Tranquil, Feng Shui bedrooms, each with a private plunge pool on the sea view terrace. Maison Tofani has the splendour of an 18th century townhouse, in the heart of Sorrento. Bedrooms incorporate modern furniture and contemporary design with original period features of the building. Dine on fresh local fish in the charming dining room. Excellent location for exploring. 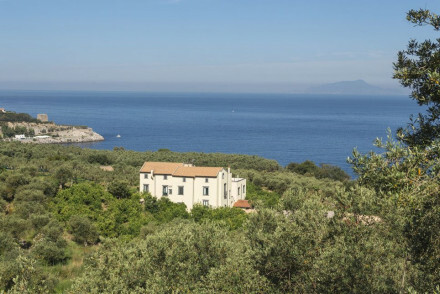 A fine coastal villa surrounded by gardens and groves of fruit trees, with access to a secluded picture-perfect beach. Expect sophisticated gourmet cuisine and elegant interiors featuring classic pieces and tasteful artwork. The fine rooms are breezy and effortlessly refined. An idyllic gem. A sumptuous resort with magnificent sea views, set in expansive gardens with a pool. Refined interiors feature elaborate floor tiles, classically elegant furniture and fine Persian rugs. Airy rooms have very tasteful details, with designer furnishings and fine tiling. A sophisticated stay. Hideaway - Tranquil and intimate. 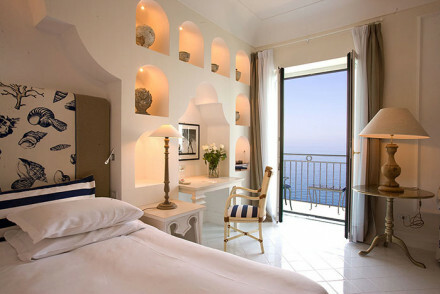 Fabulous small boutique hotel in the cliff face of Sorrento. Exquisite rooms and suites with maritime themes. Red, blue, and yellow decoration offset by white washed walls, pine floors, and the blue of the ocean. A great choice for a romantic break. Chic and charming hotel situated at the outskirts of town. Extremely quiet with great ocean views. Four poster beds, period furniture and bath tubs for the romantics. Choice of three restaurants on site. Superbly delicious. A lovely cliffside villa with a leafy garden full of tall palms and a pool. Expect fantastic food at the two restaurants, while sophisticated interiors are marble clad with elegant contemporary furniture and fittings. The bright rooms are neat and smart with great sea views. An idyllic coastal base. Nestled in lemon and orange groves, minutes from the Sorrento city centre, Villa Oriana Relais offers panoramic views of the gulf and countryside surrounding Sant'Agnello. Rooms are bright, traditionally decorated, with private patios. Total relaxation in a gorgeous family-run hotel. A spectacular Five Star hotel with a wonderful heritage. Once a private residence, then the choice of poets, artists and glitterati, now romantically refurbished and fit for the modern traveller. Utterly romantic - rambling terraces, spectacular rooms, a private beach and wonderful restaurant. Beach Life - Private beach. 5* Luxury - Very high service standards. 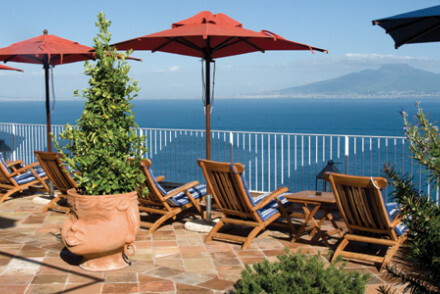 In a fabulous location on a cliff top overlooking the bay of Naples, this grand hotel offers guests luxury comfort and personalised service. Belle Epoque features as well as modern luxury suites and a romantic restaurant overlooking the water. A fine hotel steeped in history.